/ In the news/It's the in-car espresso coffee machine! Gareth Herincx writes in Automobileblog.co.uk: Ever fancied a decent coffee in the car? Good question isn't it? Everybody has at some stage felt like a good coffee in the car without having to stop in a service station. With Handpresso Auto Capsule, the first 12V onboard coffee maker using Nespresso® and Nespresso® compatible capsules, your dream comes true. This beautiful gadget simply plugs into your 12/24volt socket and sits inside the cupholder. With just the right digital touch, it offers you the luxury of enjoying creamy espressos as if you were at home. Using the espresso capsules you already use at home, you just have to remember to bring a bottle of water. 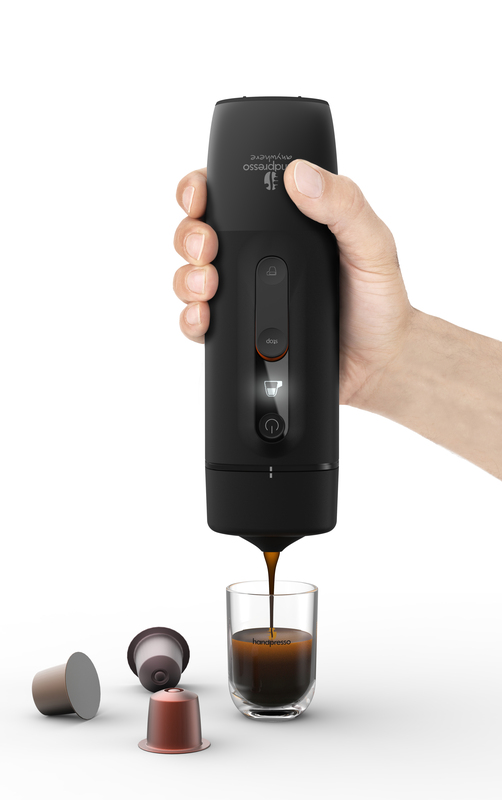 Once you've started the cycle of the Handpresso Auto Capsule, you know that 2 minutes and 30 seconds later, you'll be able to drink a creamy espresso inside your car. After the Handpresso Auto, the espresso maker for the car for E.S.E. pods and ground espresso coffee came the Handcoffee Auto. Handcoffee Auto is designed for people loving long coffees prepared with soft pods, mostly Senseo® pods. Handpresso Auto Capsule is geared towards all capsule lovers around the world. Easy to find, there is a huge variety of them, all ensuring a good result in the cup. And what is more, this coffee experience can also be shared to make it even more enjoyable!